There was a man named Yuurakutei Yakumo, and he lived. This was his story. I don’t think a single blog post can cover everything this episode offered, but I’ll try my best. First, I suppose I should begin with expectations going into this episode. From reactions I’ve read since this episode aired, quite a lot of people still refused to believe that Yakumo really died at the end of last week. I thought that was telegraphed clearly–from the candle lighting up at the end of the OP, matching the rows of candles of the rickety bridge of the afterlife, to the way it was all set up so perfectly for him to depart like that, as everything was finally resolved–but many held out hope, and I can only imagine they were shocked by this episode. I knew he was dead, but even I was thrown off with this entirely taking place in the afterlife. 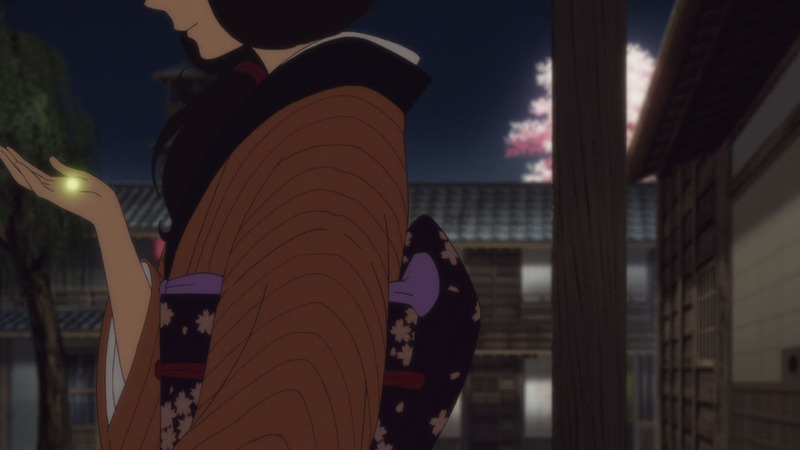 I expected perhaps a montage of Yakumo’s life to get us emotionally stirred, but instead we were transported to another world that I never thought possible, but that confirmed so many things that we needed to know before the series was truly over. I feel like it’s worth noting that with this episode, the supernatural does exist. The afterlife does exist. Spirits do exist. 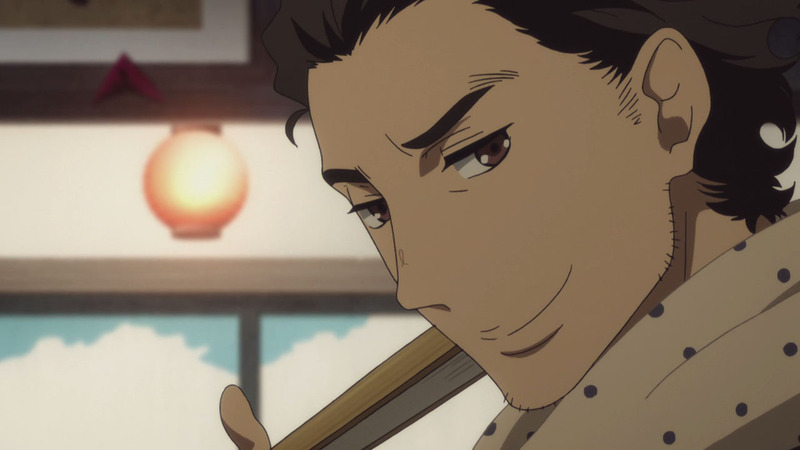 The shinigami that Yakumo saw the day he burned the theatre down was really there (and he was apparently a fan of his work), as was the vision of Sukeroku before him. I was swayed against my initial assumptions by commentors, but Sukeroku himself confirmed it all, and I did feel a little bit of satisfaction in that fact, quickly followed by: “Wait, whaaaaaat?”. 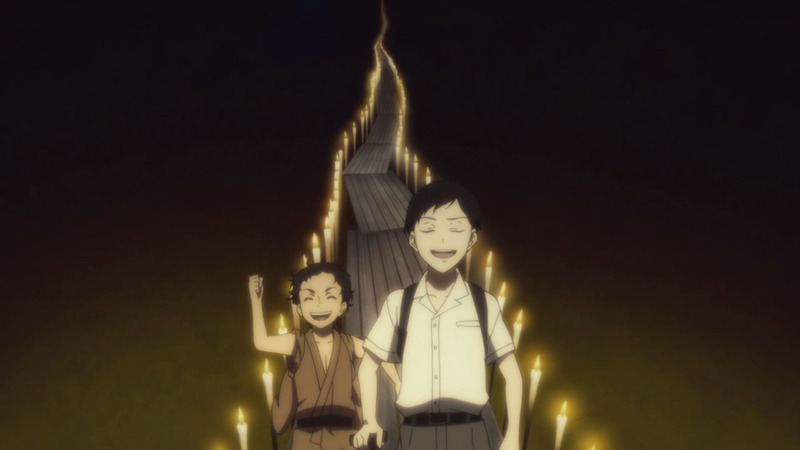 The experience that followed, with Yakumo and Sukeroku going from youth to young adulthood, exploring the purgatory where he had remained since he died all those years ago, was a surreal one to say the least. It took me a while to keep up with the speed and direction we were going, but once I’d settled in for the ride, it proved to be the most satisfying one imaginable. There’s so much I could breakdown and discuss, I don’t know where to begin. 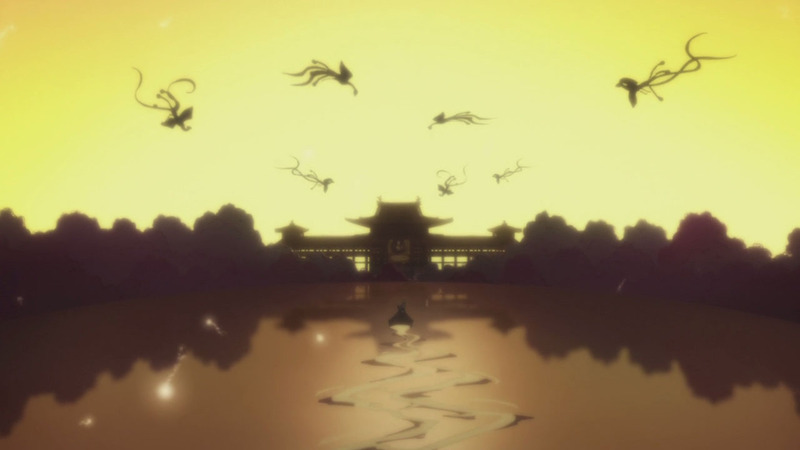 I suppose it goes without saying at this point, but this episode was especially gorgeous. With this element of supernatural and imagination we got this week, everything was so much more vivid and colourful when it needed to be, yet as dark and moody as the series has ever been. It was like walking through a storybook, and each new development was a wonder to behold. By the end of it all, I was awash with emotion and couldn’t contain myself. But I won’t jump ahead yet. I’d like to talk about a character very dear to my heart, who returned this week and whose appearance surpassed every expectation and understanding I had of her. 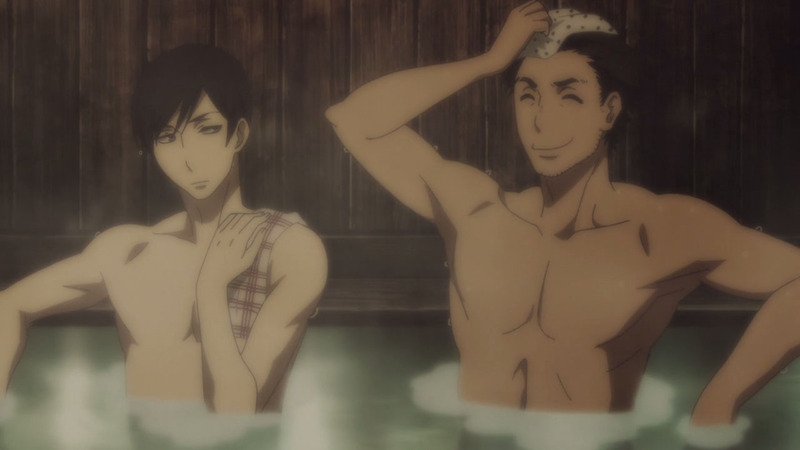 I love Miyokichi. Officially. 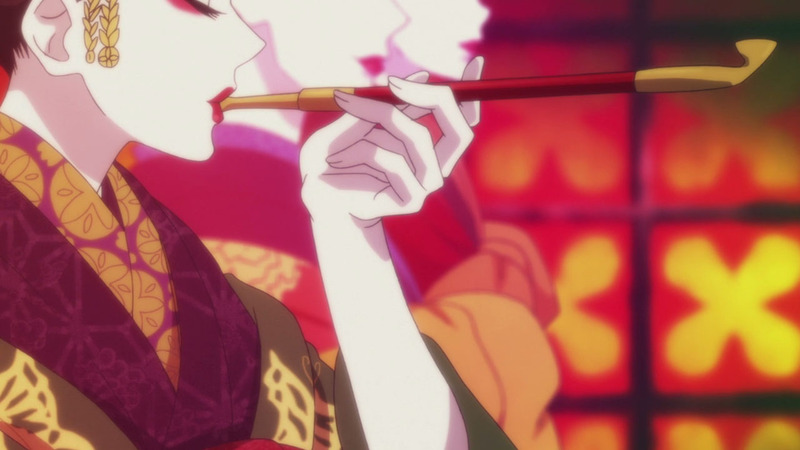 This episode put everything in perspective for Yakumo most of all, but before I delve into his arc, I should point out that Miyokichi is not the evil woman she was painted out to be. Was she ever? It’s hard to say, because now that I think back to the first season, I question everything that Yakumo claimed to be true. I expect we’re meant to take his word for everything up until that climactic night at the inn, but it’s hard to keep trust in this unreliable, masterful storyteller. What I’m getting at here is that even when we found out the truth of that night, we didn’t know the whole story. As I pointed out in that review, we jump midway into what is a highly dramatic scene and aren’t given context for the situation, as this time the truth was told through Matsuda’s eyes. We learn here that Miyokichi did not intend to stab Sukeroku that night. 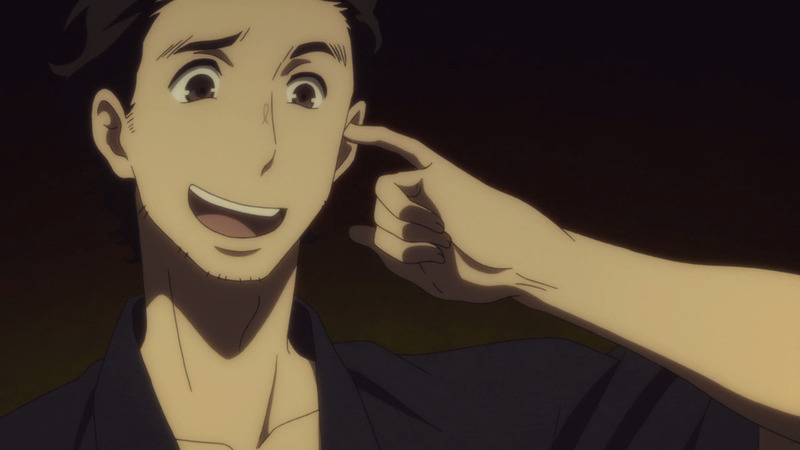 In fact, it really was all one big accident like Matsuda implied. She had that knife, of course, and likely part of her wanted to use it (I’d imagine against Yakumo), but Sukeroku confirms that his wife sliced open his stomach because she simply tripped and fell at the worst time, which explains her profuse apologies immediately after, and why Sukeroku didn’t think twice in jumping after her. She apparently made threats in their time together that she’d stab herself with a kitchen knife, in what was clearly a troubled marriage, but as this episode shows, with time to reflect on past mistakes it’s easy to admit your wrongdoings. 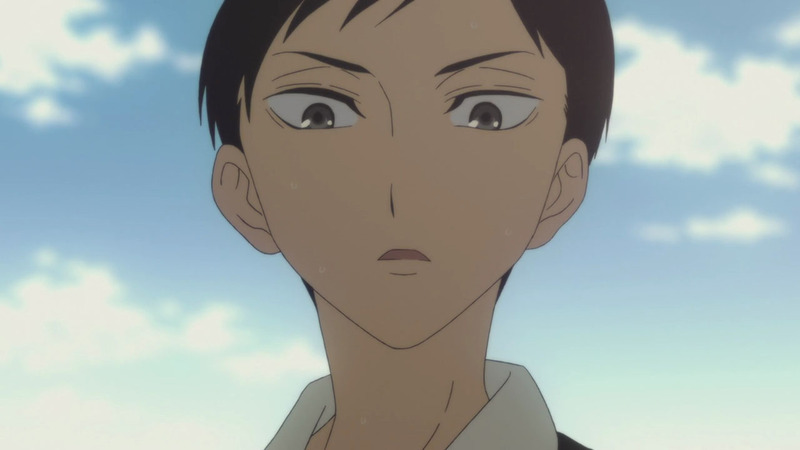 Miyokichi was by no means a perfect person. But I will argue that every decision she made made sense, at least from what she knew at the time. 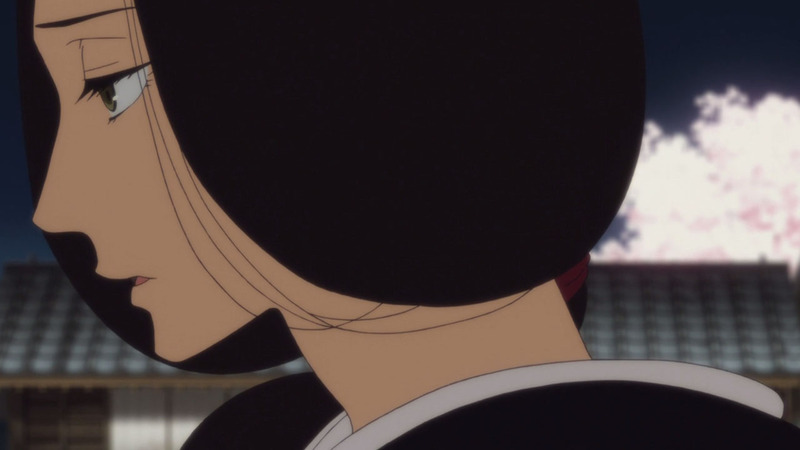 After being rejected and cast aside by Yakumo, she ran to Sukeroku and stole the one person that made Yakumo happiest. We know that she proved to be an awful mother who left her child, which is probably her worst attribute. 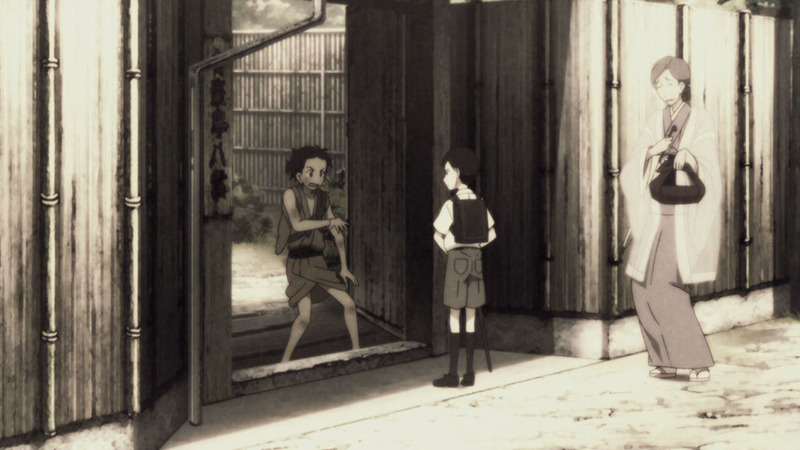 But perspective changes things, and empathy for the other side of the story makes you second guess; we shouldn’t forget that Sukeroku was a total bum who didn’t work or earn money to sustain his daughter–it was Konatsu who was making pennies for a living. 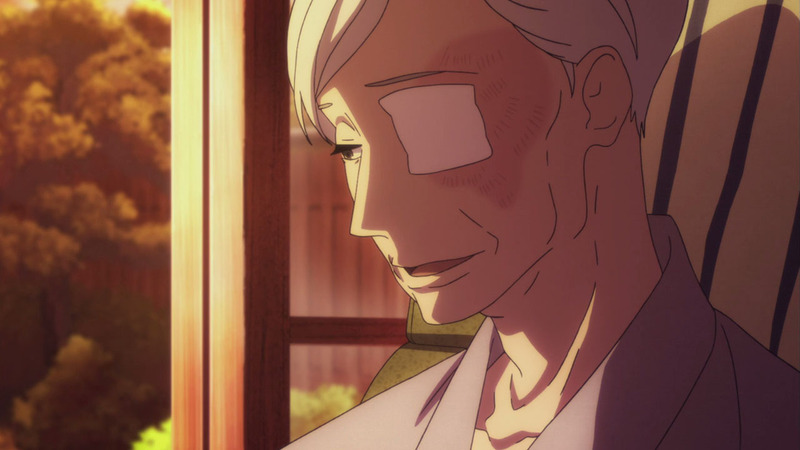 Just as Miyokichi was at her lowest, so was Sukeroku. 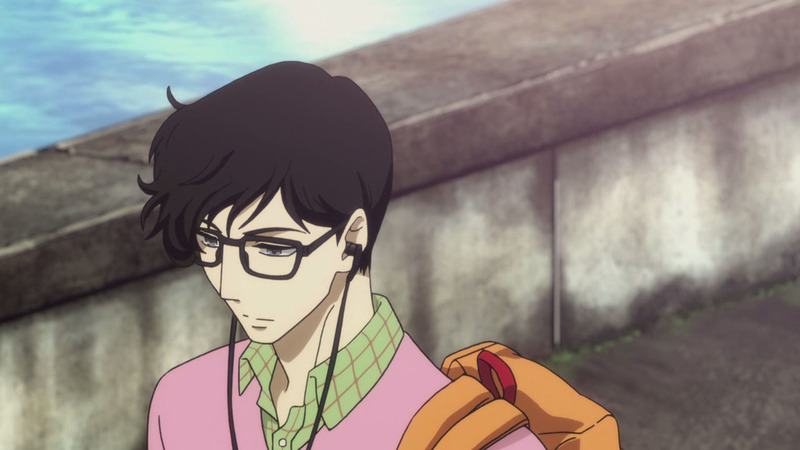 But clearly Miyokichi feels immense regret in not having that bond with Konatsu. She knows now that humans can’t live alone, that she shouldn’t have been driven by spite and malice for all the destruction it caused. 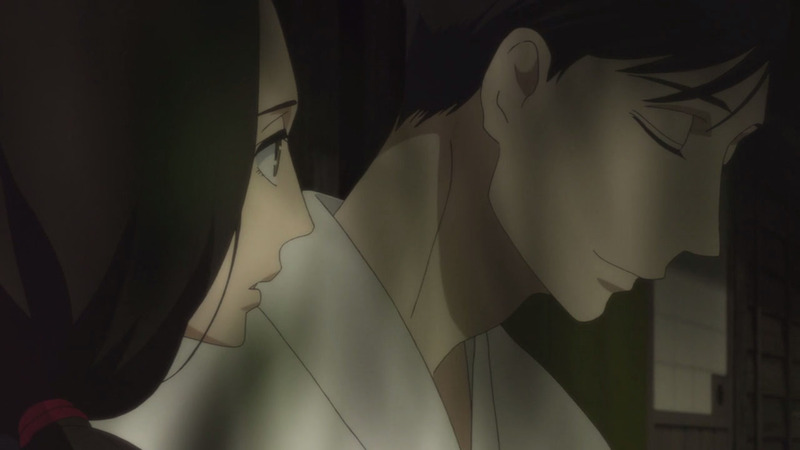 Yet it should be stated that she was not the only one who made mistakes; both Yakumo and Sukeroku made one bad decision after the other, and Miyokichi was caught between them with no real destiny of her own. I don’t blame her for what she did, just as Yakumo and Sukeroku don’t. 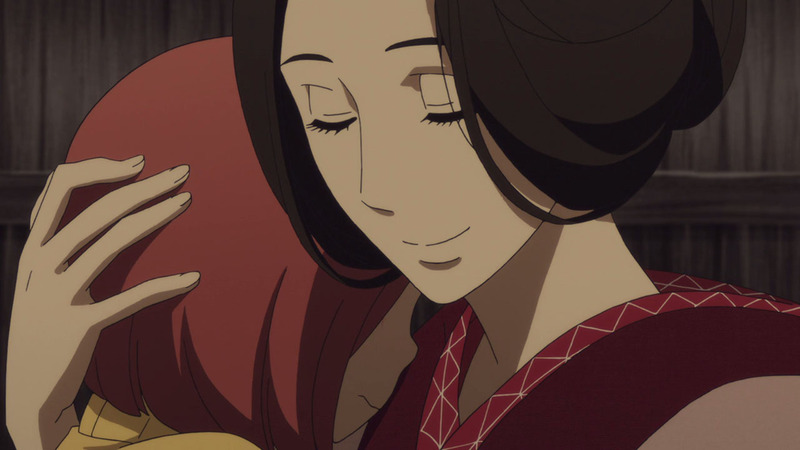 And knowing now that she wasn’t a heartless killer that some think her to be, I can soundly say she is a wonderfully crafted character; a woman of regret, of every emotion, a terrible mother who gave birth to Konatsu for nothing more than revenge. Yet as she states here, with over thirty years in the afterlife to reflect on her decisions in life, she makes it clear that she cares about her daughter, no matter what. The way Miyokichi of the afterlife speaks of Miyokichi of the living was as if she was a whole other person. 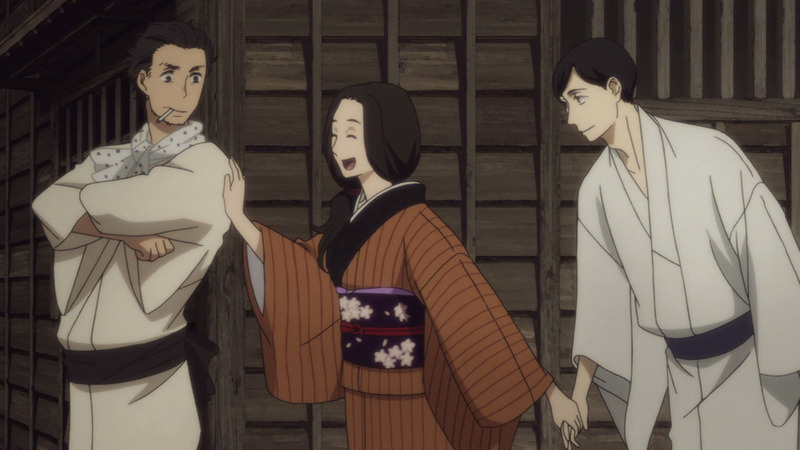 Now that she also got a resolved character arc with this episode, I can say that I don’t love Miyokichi despite her mistakes, I love her because of them. Because she–like Sukeroku and Yakumo–is as human as they come. 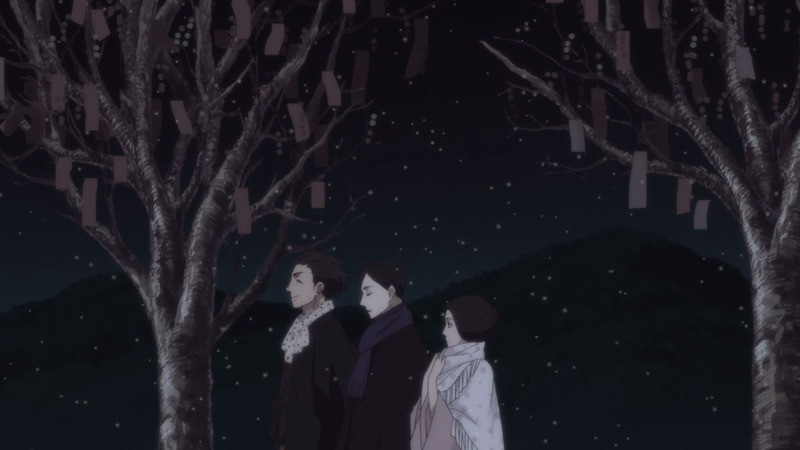 Seeing the original trio together, walking through the snow, or in the rakugo theatre together, are perhaps the most surreal moments of this episode. The entire first season was established as an inevitable tragedy and plagued every interaction these three had, because we all knew it was going to end horribly for them. Yet there is absolute peace between them in death; none has true regret or hatred for the other. 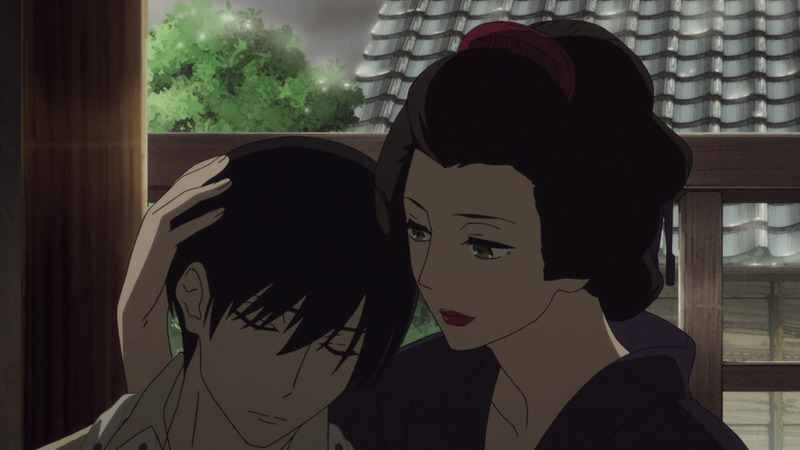 Sukeroku and Miyokichi still refer to each other as husband and wife, and despite everything that happened there is affection in their interactions which otherwise would have just come across as cruel and hateful. They lived together, they died together, and having spent so much time waiting in purgatory together that it appears they’ve grown to finally love each other. 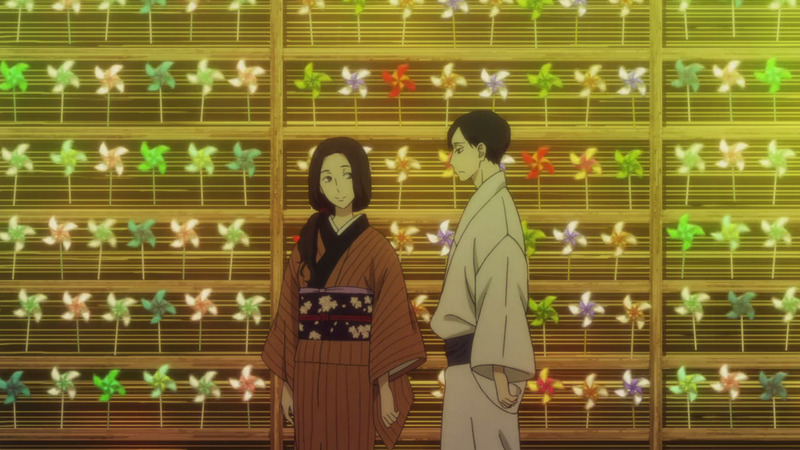 The way Miyokichi remarks that her Kiku sounds like an old man, and that she’s happy they never worked out as a couple, puts a smile on my face when I never thought possible. I expected resolution with this episode, but nothing of this level. This wraps up everything. 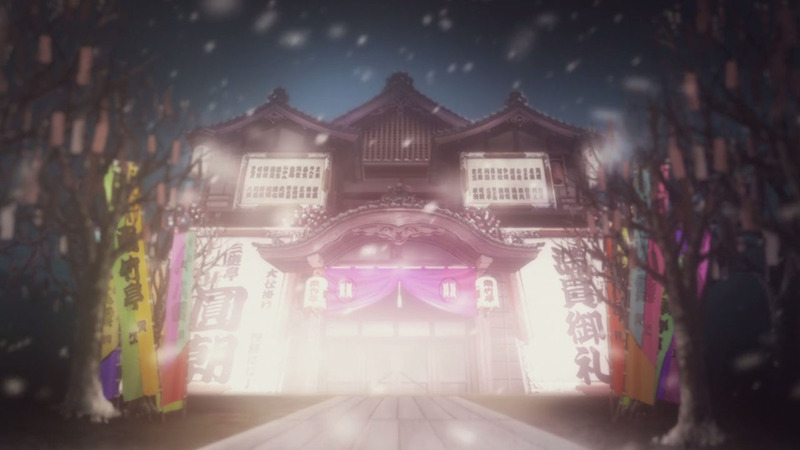 That brings us to the rakugo theatre, which has also moved onto the afterlife since Yakumo burned it down. 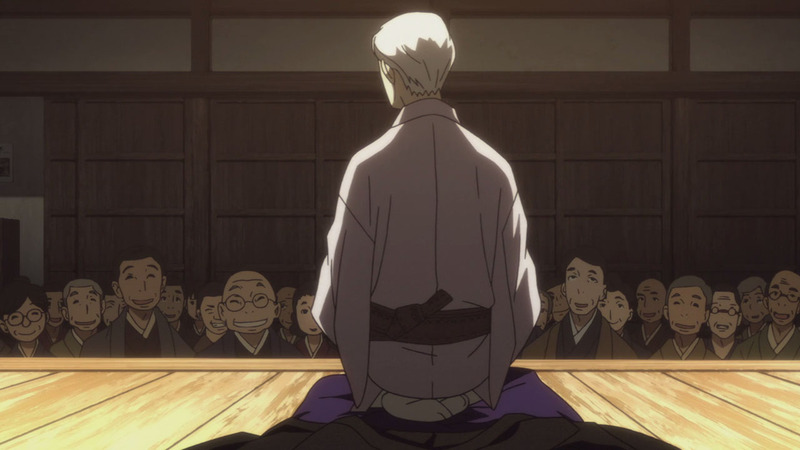 How fitting that Yakumo’s final moments here would be with rakugo, and especially with him seeing Sukeroku perform once again. I’ve got to say, this was a real treat to watch, and the voice acting here was superb. 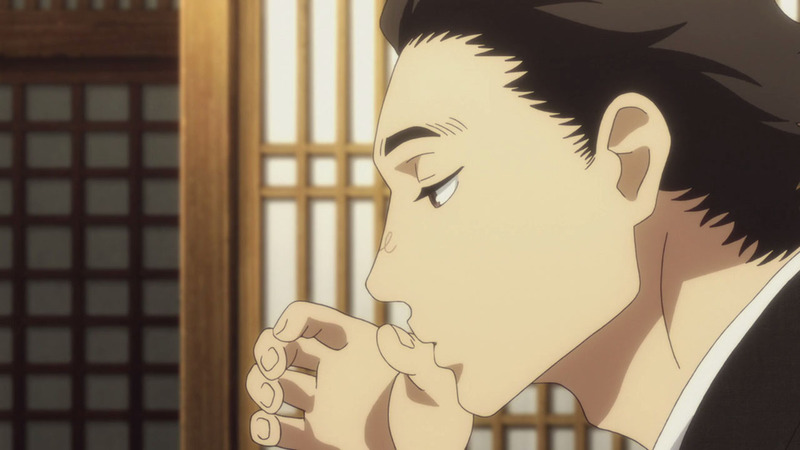 It genuinely felt like he was sipping on that sake and munching on those onions–and the delivery of the jokes was spot on. It also allowed little Konatsu to return and finally be with her mother, in an embrace that I never thought the series would offer. Of course, none of this is really happening with the Konatsu we know, but after last week when I expressed how their mother-daughter bond would never be what it could have been, this moment made me so joyous. It was wonderful, made even better when it’s Yakumo’s turn to take the stage. 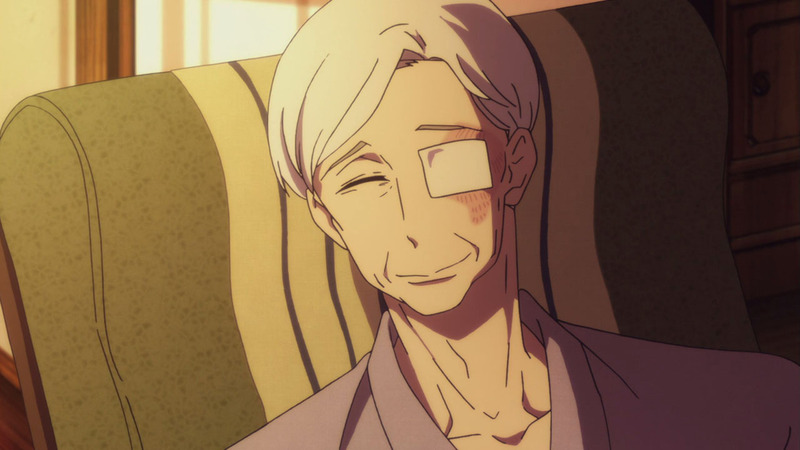 When Sukeroku holds onto him from the sidelines, and we get transition manga panels, followed by Yakumo counting until he opens his eyes and he’s the old man we’ve come to know. I felt myself get emotional at that point, and it only got worse from there. 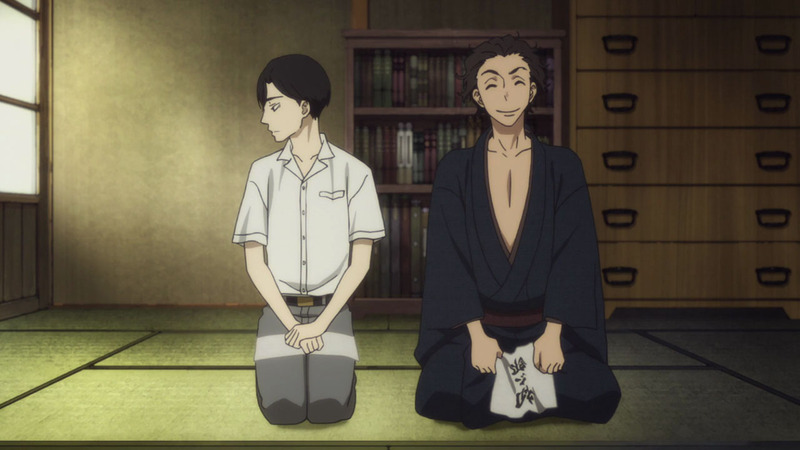 When the same cushion that brought Konatsu to the theatre showed that Shin was the one person Yakumo wanted to see his rakugo, I started to well up. 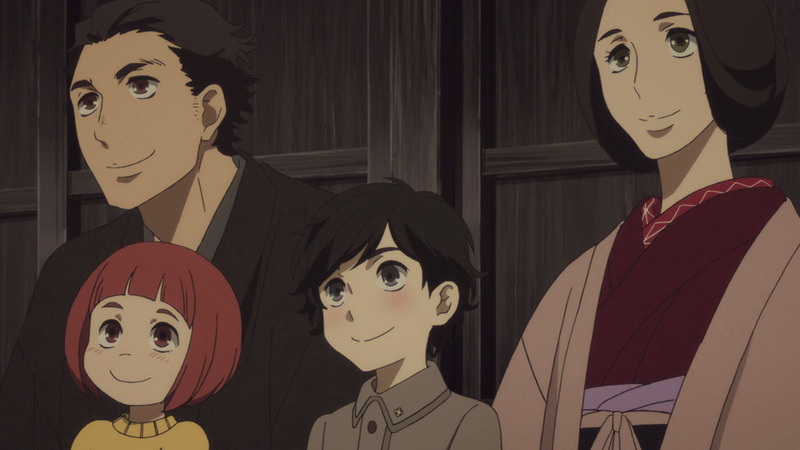 Rakugo Shinjuu’s story of the generations is masterfully told, and having the entire family, from Sukeroku to his grandson all watch Yakumo perform Jugemu… it’s pure bliss. As we’ve come to expect, Ishida Akira’s voice acting talents flourish, in a story that is meant to be comical and silly; here, the words have a grace to them that it’s hard to explain, but all I know is that I’m consistently impressed with his work in this series–it would be fair to say that Yakumo is Ishida Akira’s best performance in his career. And then it comes, the moment I was equally anticipating and dreading. 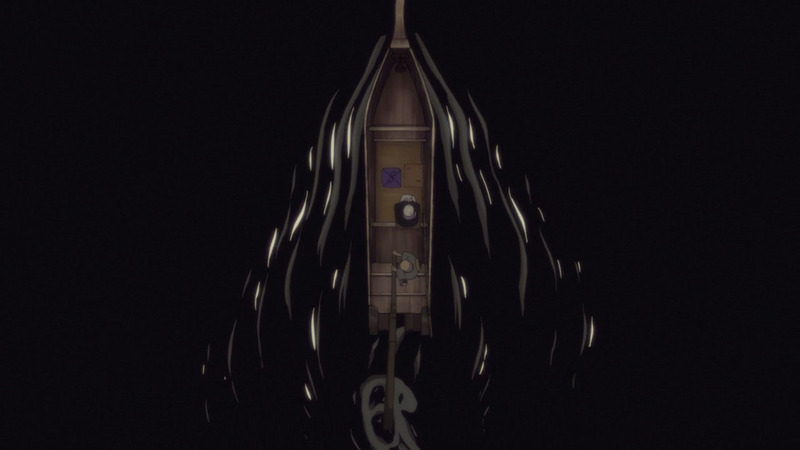 I feared the episode wasn’t going to cover it as the runtime grew shorter, but when we cut to Yakumo on the boat, preparing to ‘move on’ from the afterlife, the tears started rolling. 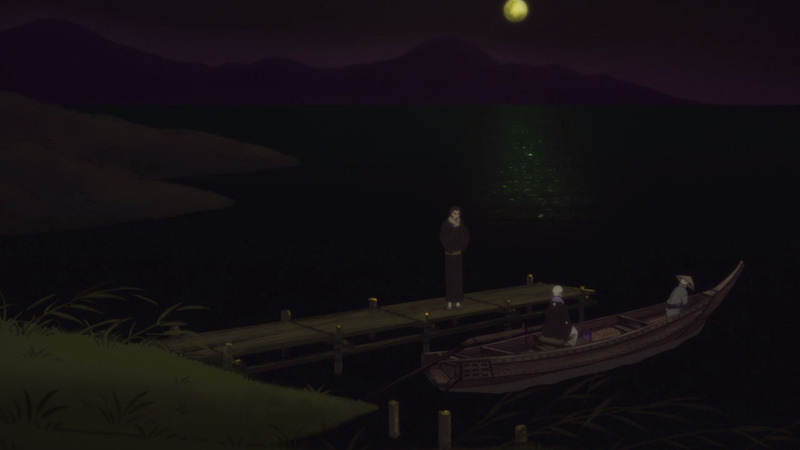 As you’d expect, Sukeroku was jovial and upbeat for the majority of this episode, despite the morbid circumstances; but when he really had to say goodbye to his best friend for the last time, it hit hard, as they make that pinky promise, as the boat drifted away, and we were left with that final shot of Sukeroku. And then what happens? 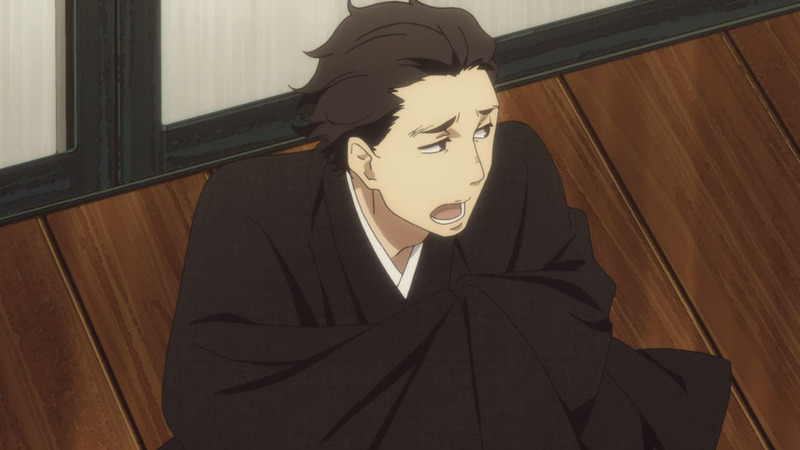 I begin legitimately sobbing when Matsuda reveals himself and explains what happened: Yakumo fell into a coma on the porch that spring afternoon, and shortly passed away, but not before Matsuda sat by his master’s bedside, went to sleep, and never woke up. 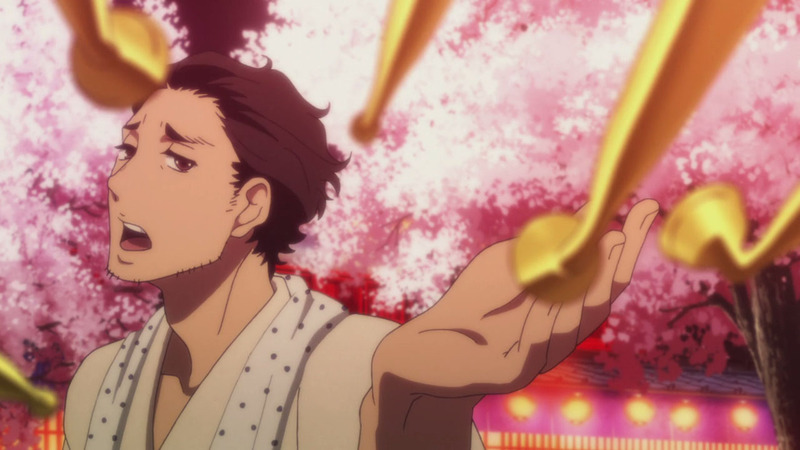 The fact the death of Matsuda is what sent me over the edge, despite him being a minor character in the grand scheme of things, is testament to the power of this series. 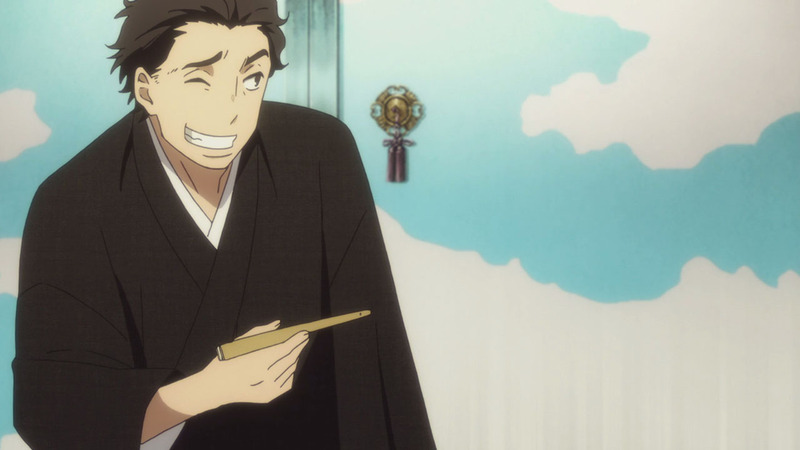 In fact, Matsuda has always been there, whether in the background, providing amusing commentary or showing dedication and loyalty to the rakugo masters he served. 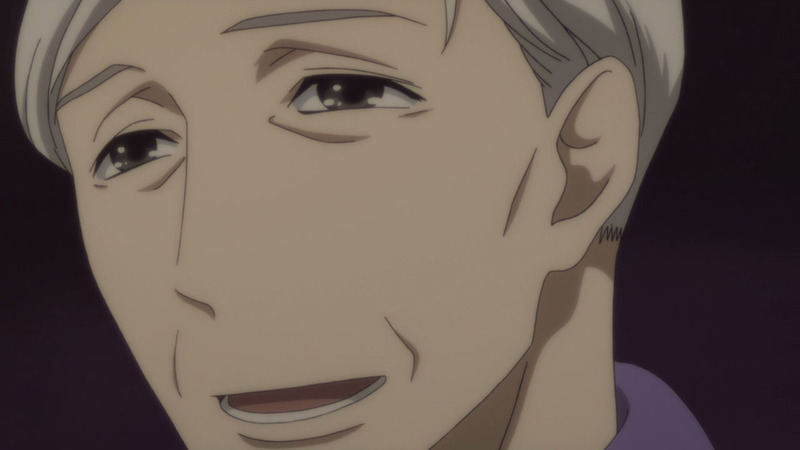 He was older than Yakumo, yet there was a youthful spirit about him. 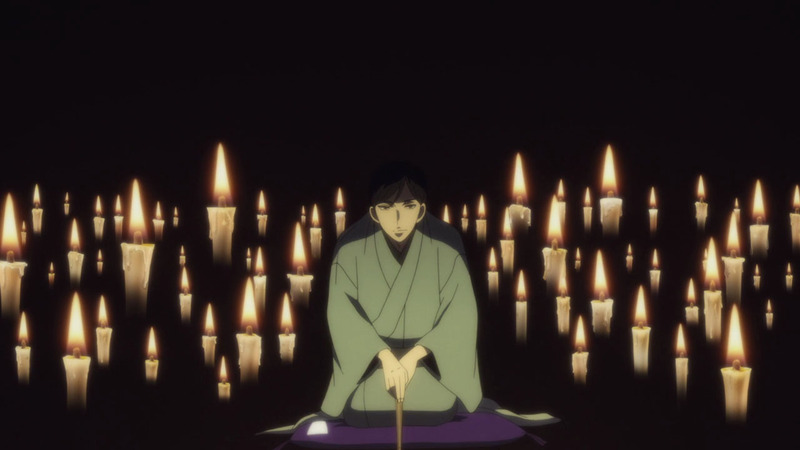 He revealed the truth as he saw it that night, even as Yakumo took the secret to the grave, and with his purpose gone, he quickly followed his master to the afterlife. 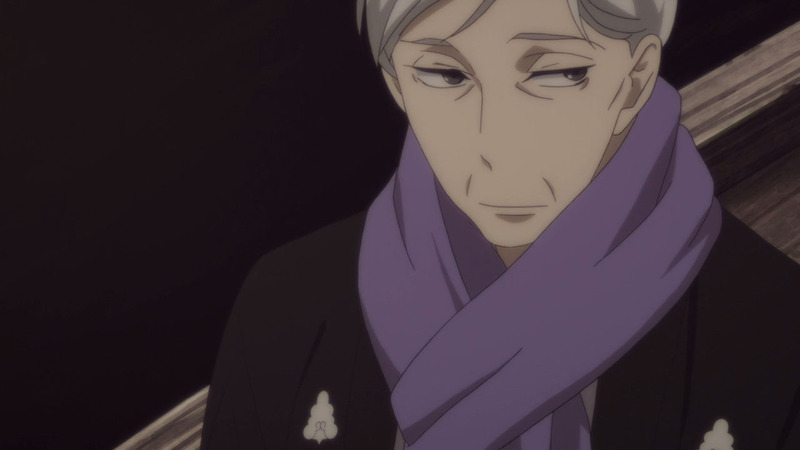 Seeing Sukeroku again was a joy. Miyokichi getting the closure I never expected was beyond what I could have hoped for. Matsuda completing his lifelong service even in death was emotional. 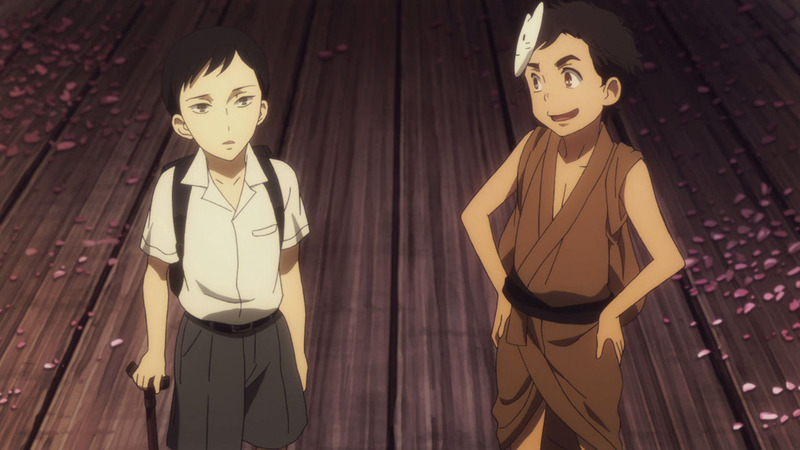 Seeing Konatsu and Shin as children, enjoying Yakumo’s rakugo together… those moments are what made this episode so special, so warm and beautiful and reflective. 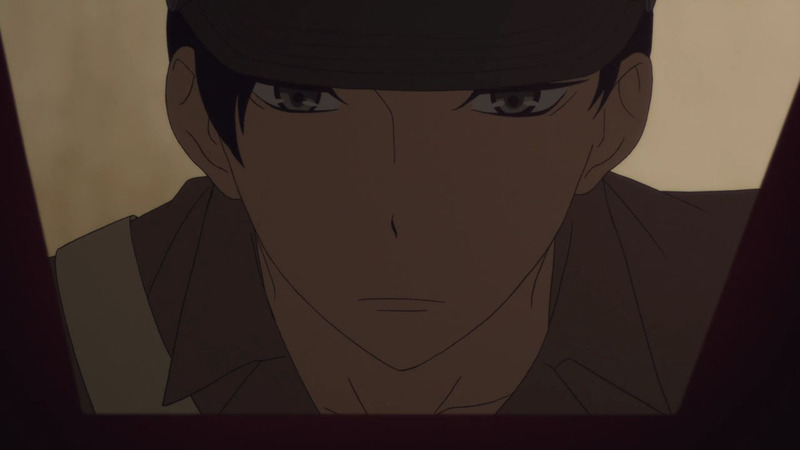 But what makes this episode–and the series–a masterpiece is simply Yakumo. 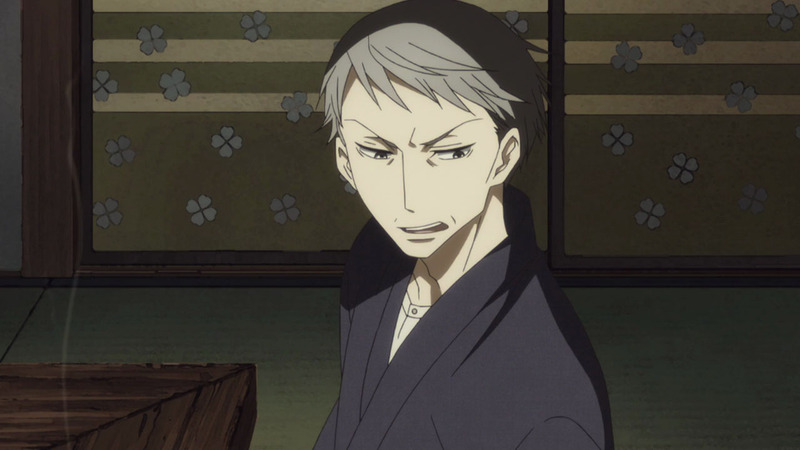 I can’t think of a better anime or manga character than Yakumo. 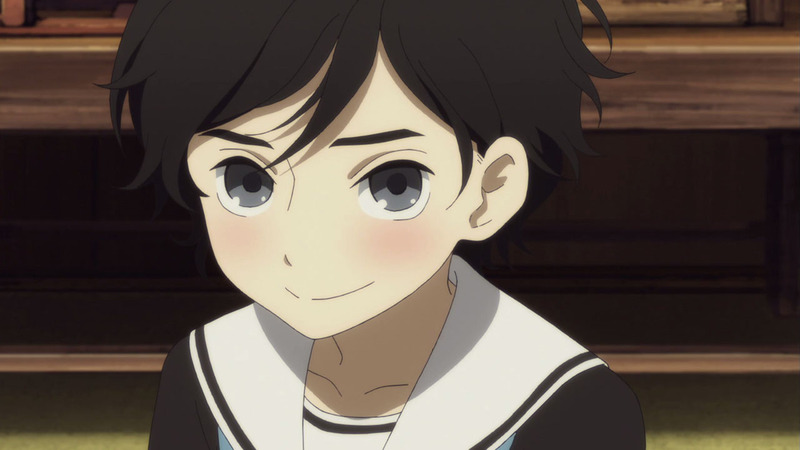 It can be hard to identify the difference between what’s your favourite and what’s the best–I for example personally prefer Miyokichi’s character, if that wasn’t obvious already. But if we’re talking about the best-written, most fully realised, accomplished character in the medium? Yuurakutei Yakumo should be considered one of the very best. We were introduced to him as a resentful and bitter man, who seemed as unfriendly as he was stubborn. We then learned that he was disabled from childhood, that his family abandoned him and he forgot what his real name ever was. 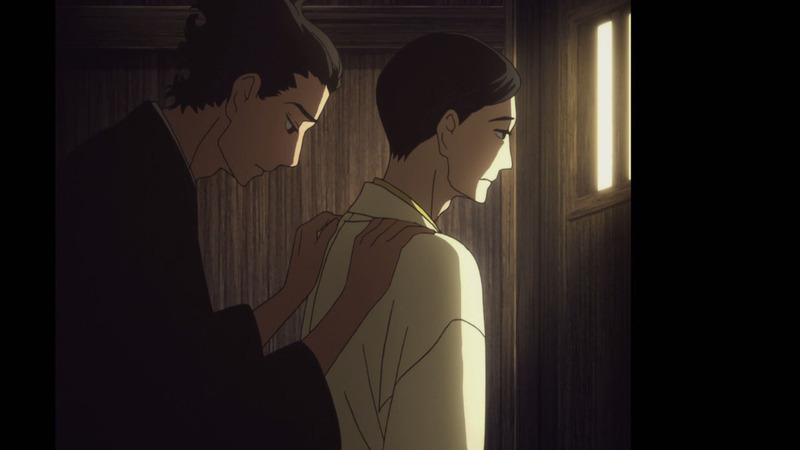 We saw that he met a boy who loved rakugo so much that he shared his path, convinced for his entire youth that he would never surpass him. We saw him survive the war, fall in love, and then make horrible mistakes that would lead to tragedies he never could have predicted. We saw the best and worst of him, from a child, to a one eyed old man with a frail voice who could barely move from his chair. We saw how he lost everything in his life, from his master, his best friend, and his once lover. And as we now know, we saw that he wasn’t the cruel adoptive father he made himself out to be; he saved Konatsu that night and he didn’t abandon her like his parents abandoned him. He raised her, holding secrets and allowing his new daughter to think of him as the worst man in the world. We then saw him age, perform, become the master he was meant to be. He took on a foolish apprentice who just got out of jail. 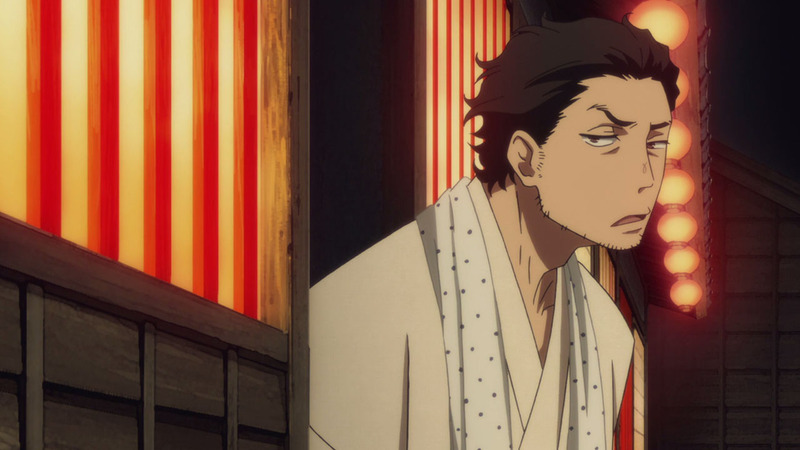 We saw Yakumo wrestle with the future of rakugo, caught up in the perverse notion that he would take it to the grave with him; that if Sukeroku–the one who introduced him to storytelling–could not be the one to shape the future, then no one could. But he realised he was wrong, no matter how he felt. He saw his best friend in his grandchild, and softened. He grew old and frail and we saw him consider suicide, dancing with death far too often, leaving him scarred and worn from it. And in the end, we saw him smile. He accepted everything, he was at peace, and he died. We saw his entire life, and I honestly feel like my own has been enriched from the experience. 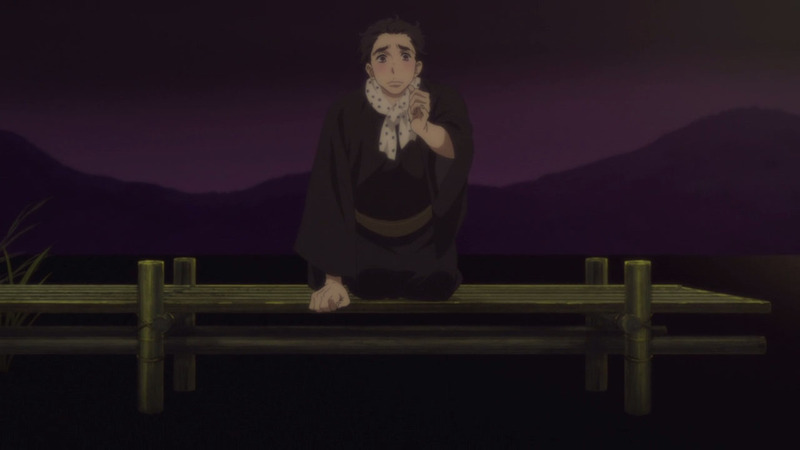 Shouwa Genroku Rakugo Shinjuu is a story of many things that I will cover in my final post next week, but above all else it was the story of Yuurakutei Yakumo’s life, and what a life it was. It all ends next week. It’s hard to believe it’s going to be over, but I have every faith it will prove to be as perfect a finale as every episodes that preceded it. From what the preview shows, we see Shin and his younger sister many years later in modern time (probably 15 or so years). We’re jumping way ahead here. 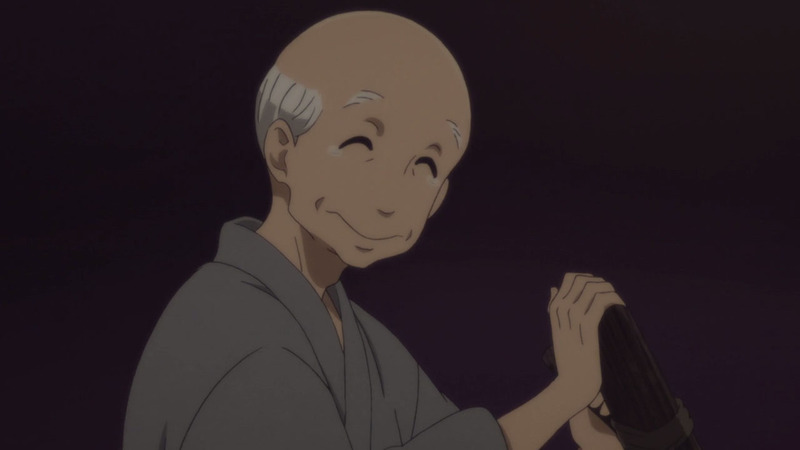 This means we’re going to see an elderly Yotaro and Konatsu, their grown up children, and the effects to modernise rakugo. I can’t wait to see what awaits us, even knowing it really will be the end of this wonderful story. I can’t believe we are down to the last episode. Sitting down, watching this man’s life and his struggles was the best ride I ever had. I can’t deny the tears that fell down from my eyes. I didn’t know what to say. This is truly one of the best anime that I’ve watched after a long time. I’ve said this when the show opened last year, that I’ve never seen an anime like this for a while. I didn’t regret watching it. I am glad I picked it up. Hooray for anime with impacts in the cultural and moral aspect. The transition of animation was on point especially on his last performance. I have no words. I shall sit back and wait for next week to come to see the curtains close for the greatest anime in a while. It really is the greatest. Truly. I haven’t read this completely but i feel I have to say this. It is entirely possible to not think of this as the afterlife. It could very well be Bon’s dying dream. 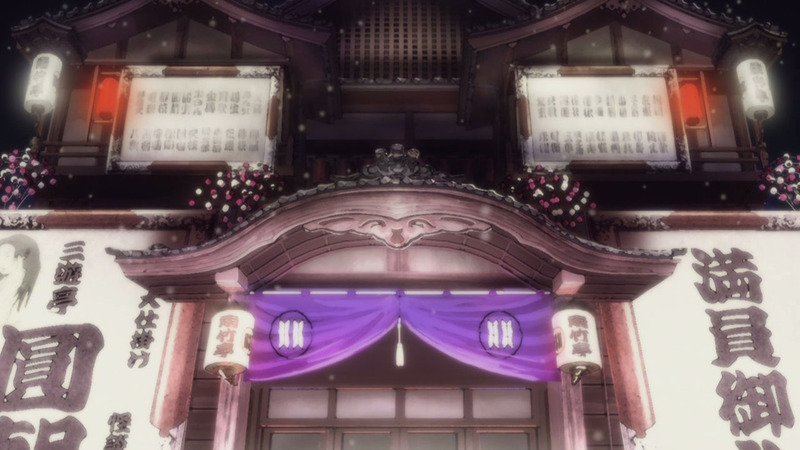 Much like the season 1 deaths of Sukerako and Miyokichi were the way that he would have liked that event to play it if it had to this, I think, is how Bon pictures the afterlife to be. In the end, whether you believe like me this was Bon’s final story told only to himself to help him let go of the world and move on or actually in the afterlife, it doesn’t make it any less real. Still a very well done episode. I don’t get why there’s so many arguments put forth that this is Bon’s dream. This is a story, and for the course of this story, if supernatural element is needed to close Sukeroku and Miyokichi’s character arcs, why not just go along with the flow? Denying them the possibility of coming to terms with their errors and just attributing it to Bon’s imagination is quite cruel in my opinion. Konatsu also has experiences with seeing Miyokichi’s spirit, and she could see Miyokichi’s spirit haunting Bon at the prison performance. Even if one wants to stretch it into the territory of shared hallucinations, it’s still pretty darn supernatural. Look, I had a long post I wrote here but I am just going to say this instead. We both thought this was a beautiful episode. As I said, even if it was a dream does it change the end result that it gave Bon peace in his final moments? I don’t think there’s anything to indicate it’s a dream. All examples of unreliable narrator have shown inconsistencies with what we already know to be true. And I’m confident if there was an intention for this to be interpreted as a dream then there would be at least some inclination that it was. This was played seriously despite how jarring it may seem to set an episode entirely in the afterlife, but I wholly believe we’re meant to read it just as it says it is. And I would argue that if it was a dream it would cheapen what we saw. 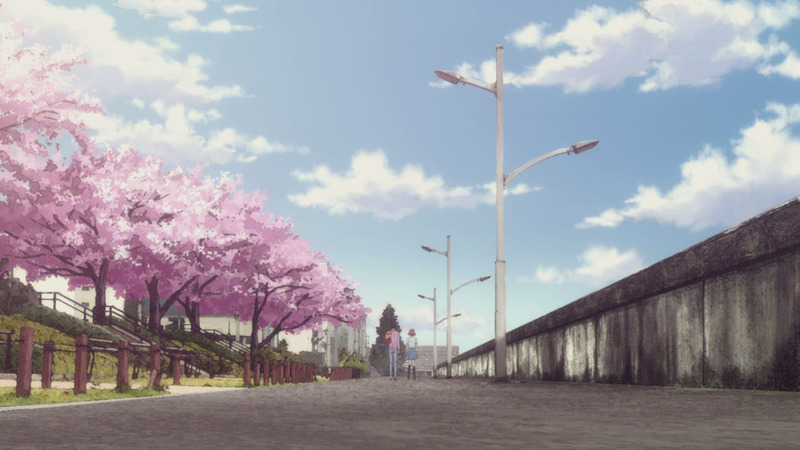 If the reunions and resolution of Yakumos, Sukeroku, and Miyokichi were all imagined and didn’t actually wrap up what happened when they were all alive, it would less the effect dramatically. 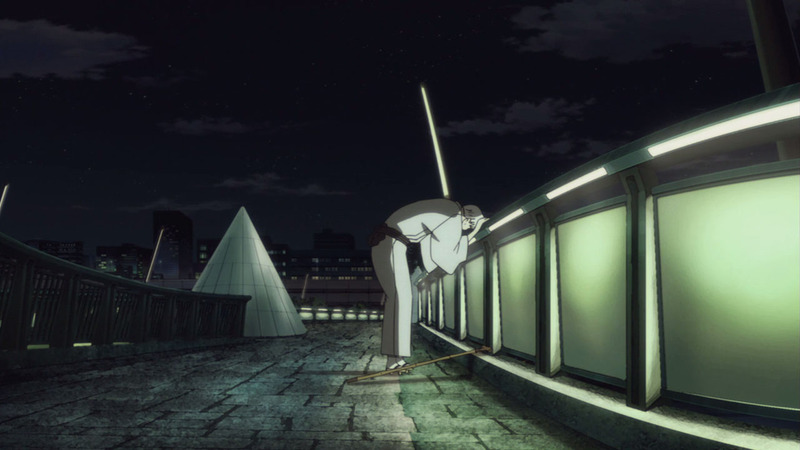 To me, Kumota Haruko was clearly going for a Buddhist afterlife here. That’s fine if that was his intention but with only having supernatural stuff in the second season and up until this episode having all of it being rather explainable, it would completely take me out of the story. And honestly, while the manga could be more authoritative on this like Scampi mentions, the anime leaves it as this nearly out of left field episode. I’m not saying he’s unreliable as a narrator here. I’m just saying i could see this has Bon’s final story that ties up the endings in “the afterlife” a lot nicer than they could be in life. If we perhaps had more indication of the supernatural back in season one laying the ground work for this I could probably be a bit more accepting of this turn in the story. 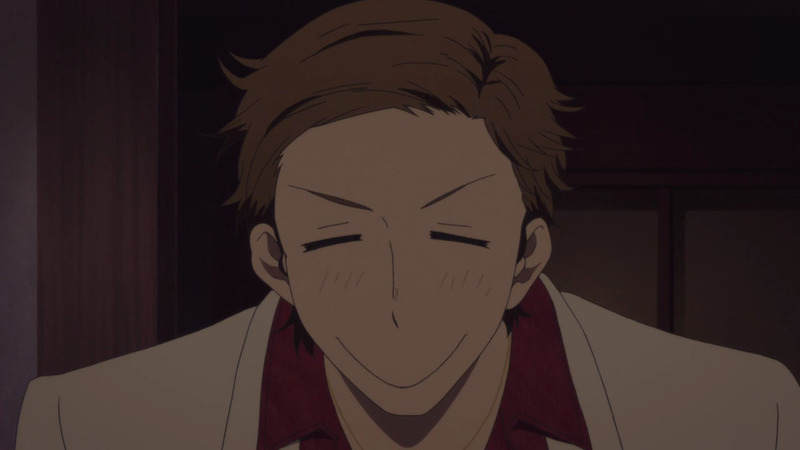 The reason why there is no supernatural in the first season would be because it’s told entirely as a story from Yakumo’s perspective. This season hasn’t followed that pattern, and since the moment Miyokichi showed up (which I don’t think was supernatural, merely his own manifestation of what he assumed MIyokichi would be like if she “haunted” him), it seems to be hinting in that direction. 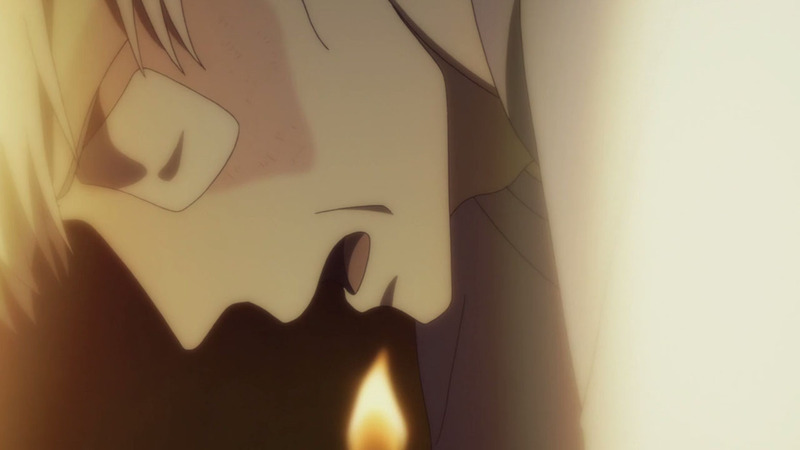 When Yakumo first “died” it was clear to me that he was literally being pushed back into the world of the living by Sukeroku, and then we saw him later on before he burned down the theatre. So we’ve seen indications of spirits/supernatural at least four or five times over this second season, which all leads up to this episode. Having the afterlife be explored in great detail like this is not what I expected, but I don’t read any of this as dreamlike. 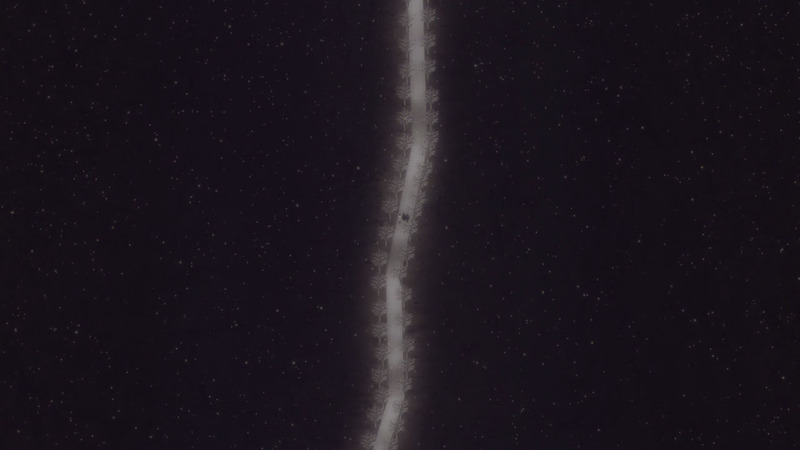 Just that as Yakumo grew older and closer to death, this manifestations and hints started to occur more often. I get that. I was just saying that it’s difficult for me to accept the sudden swerve into the supernatural. That’s why I’m thinking of it as I am. To me it doesn’t change too much of what we were shown either. Let’s just agree to disagree because we aren’t going to change anyone’s mind. 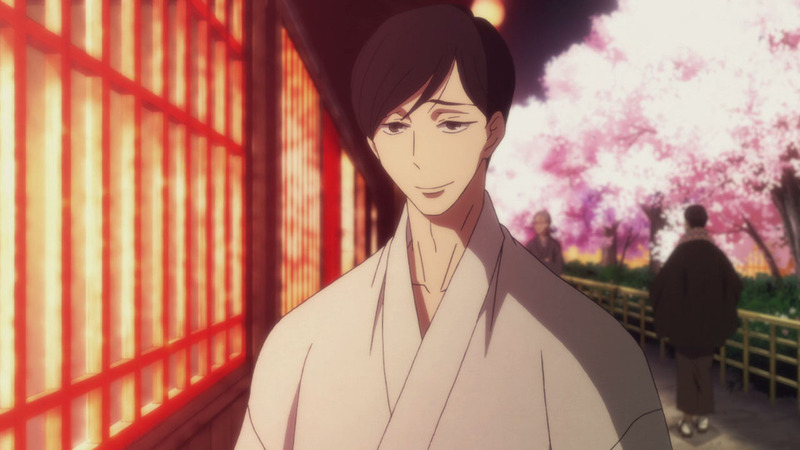 What a life Yakumo lived and I am happy he was able to be with the people he loved in the end and that those characters were finally able to get the closure they deserved. 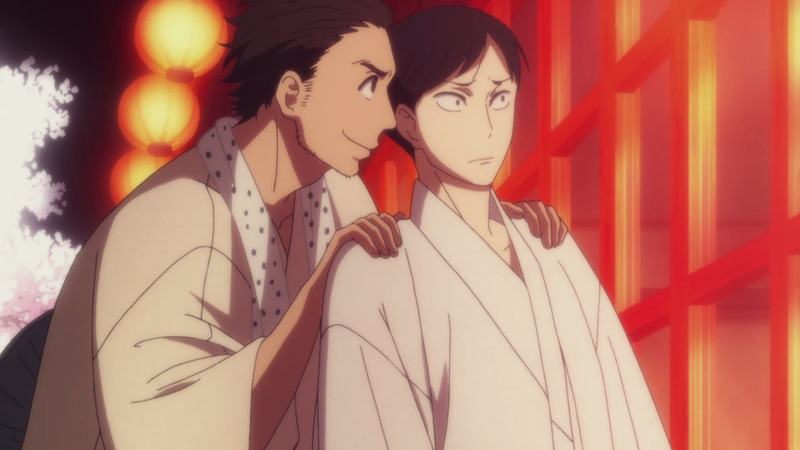 While I know Yakumo loved Miyokichi, its clear his true love and his soulmate was and will continue to be Sukeroku. The amount of nuanced emotions that exist with them both in the living and the afterlife hits me so hard that I am sad those two were never able to fully express themselves about it until the end. Who knows maybe in the next life if Sukeroku ever moves on they might have another chance. 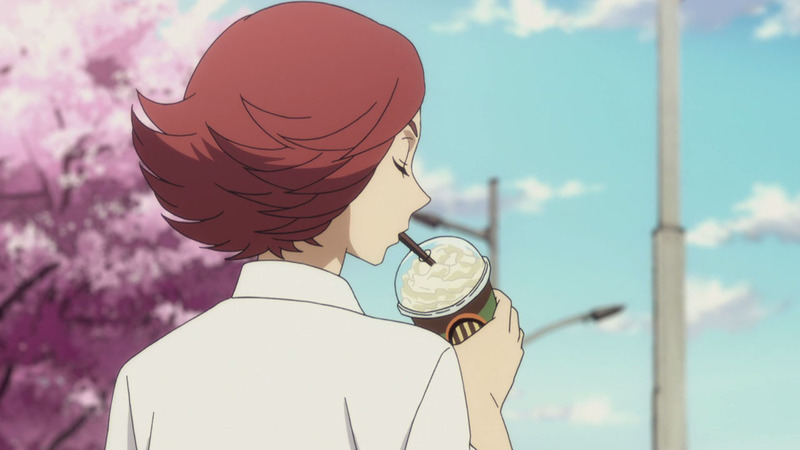 I am so glad Miyokichi finally got ending she deserved because in the case of her character she was so complicated and in the end of the day you had a flawed woman who just wanted to be loved in the end. 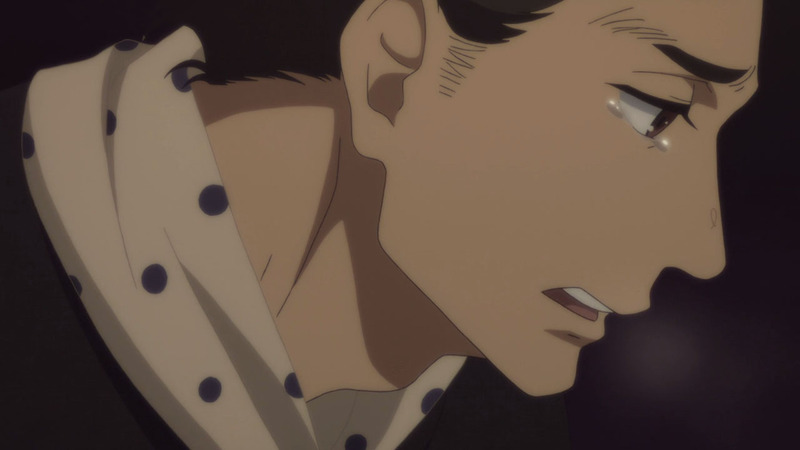 Its literally beautiful that Yakumo got to say goodbye to everyone in the end and despite how complicated his life turned out to be, he lived a full and healthy life with people who loved him. 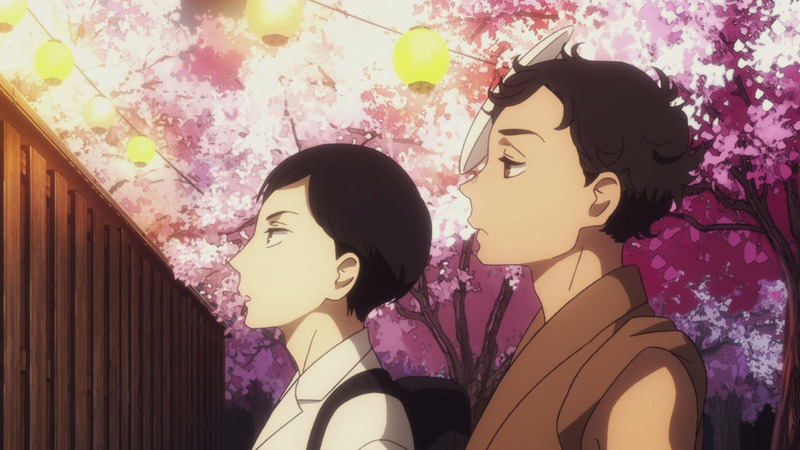 Now I am interested to see how the future looks like with this new generation and how rakugo will move forward with them at the helm. 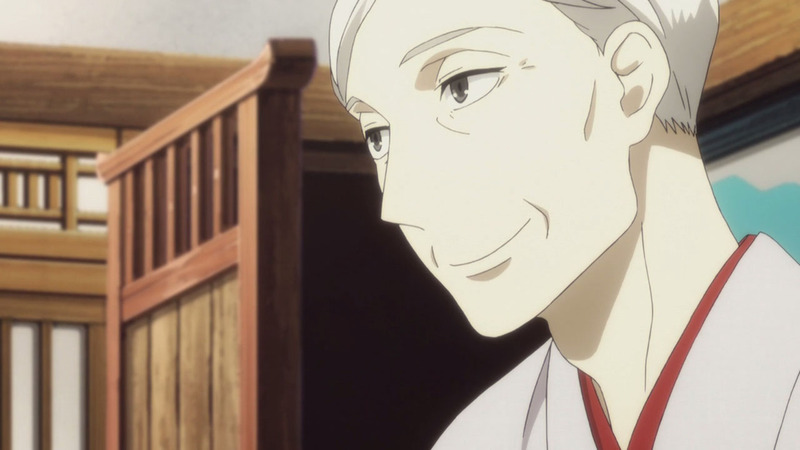 It’s a pity that Yakumo couldn’t teach rakugo to Konatsu before he died. I really wish they could spend more time together. Matsuda died? 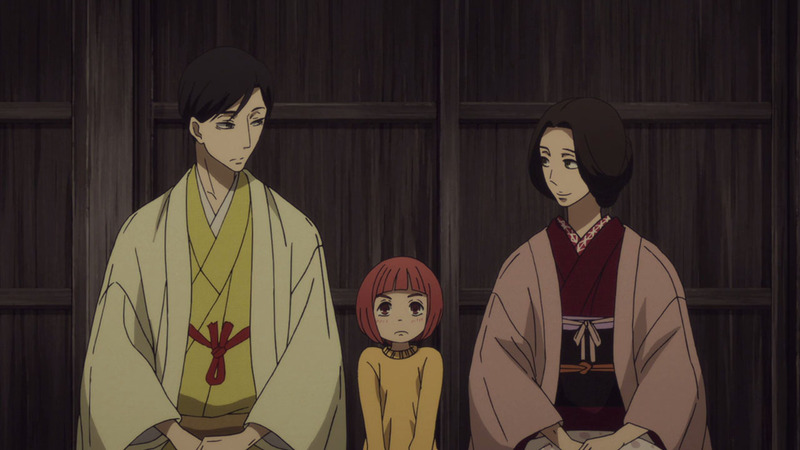 I doubt, maybe he like with the child incarnation of Konatsu and with Shin, it was just a reward from Buddha to him. Yup, Matsuda died. He said as he lay by Yakumo’s bedside that he ‘fell asleep’ and woke up in that place (the afterlife). He was older than his master, and likely lost the will to carry on after he left him alone. There was no indication that the gifts from the Buddha extended further than the cushion, everything else was played seriously. At this stage it makes sense to take the characters’ words for what they are, because we’re already in the final stretch. Jeeeeez every single time we revisit the “fateful night at the hotel” the real incident gets dumber and lazier. Okay so first they committed a highly romanticized and dramatic double suicide. Fine, no problem, this unrealistic scenario can be forgiven, and it’s thematically powerful as it fits with the “shinjuu.” THEN it was an attempted murder and a 6-year old girl pushed a grown woman down a balcony. Well… okay. NOW, well waddaya know it was just an accident, lol! HOW CONVENIENT. Are you kidding me? This is ridiculous. It doesn’t seem that ridiculous at all? 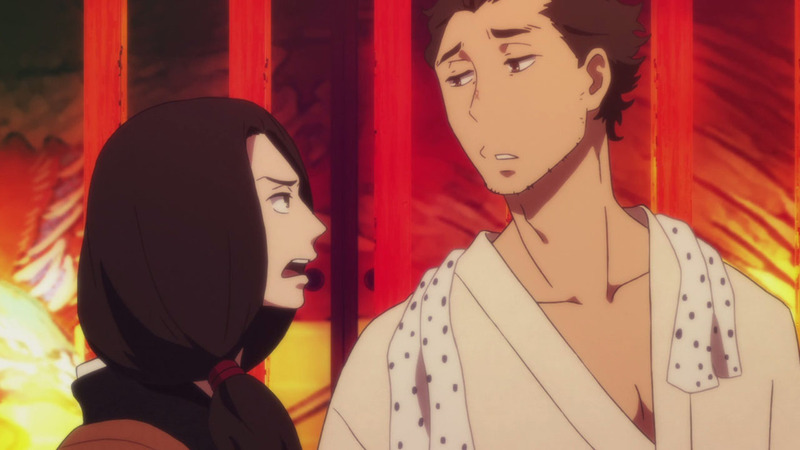 Miyokichi arrived at the inn with a knife, with some malicious intent, however what occurred was a freak accident that Konatsu jumped into at the wrong moment and caught Miyokichi off guard when she was spewing out apologies and an emotional mess. It’s not that hard to believe, really? The layers of reveals is what makes it so striking each time we revisit it. Our blame shifts from one character to the next, until we realise in the end no one was really at fault and their deaths were a true tragedy. The “night at the inn” is the most pivotal moment in the plot by far and without question. It is not good writing that it goes through these revisions each one being more contrived than the last. It starts out as a night shrouded in mystery only to be ultimately revealed that “lol, it was just an accident!” by an OFF-HAND COMMENT at that, when the characters are already dead and having a good time so it doesn’t even matter to them anymore. I dunno how else to describe it, it’s just dumb. All the solemnity, all the gravity of the issue and the decades of consequences it had is kinda flushed down the toilet. Agree to disagree then. I think each time we got closer to the truth it served in clearing up misconceptions we had of all the characters involved, and was evidence of smart writing. Anime of the Year 2017. Nothing can top this, and we still have a good year of stuff coming out. 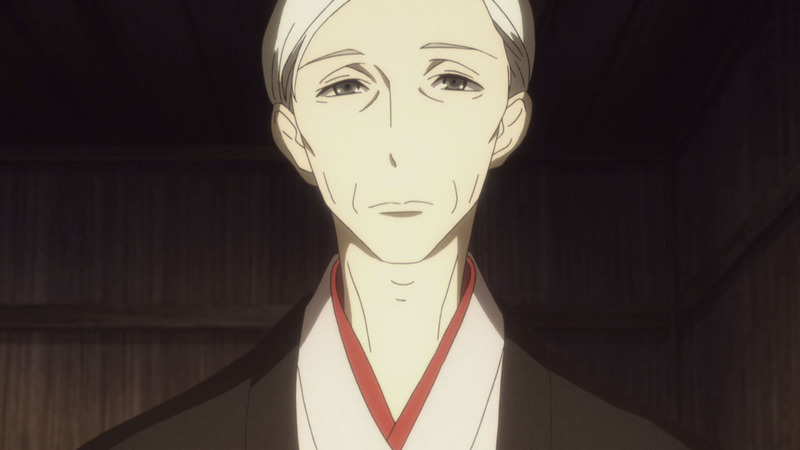 The only other show I can see competing with Rakugo is Uchouten. 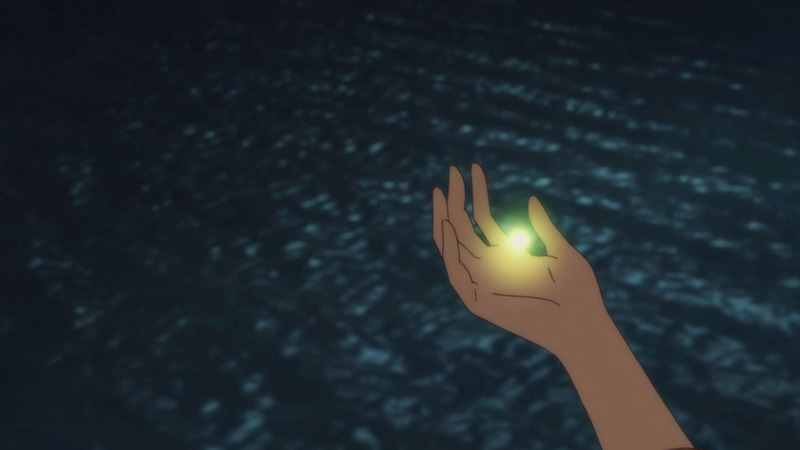 Uchouten is a possibility, but like you, I can’t see anything else even coming close to this level, never mind topping it! Nikki: This has to be Anime of the Year 2017 or I’m not even sure if it’d be in Anime category. The storytelling is beyond phenomenal, its like reading through your favorite book and page after page it shows you that you are not merely reading that text but living in the world it is in. Watching the life of Kiku-san has been a true bittersweet journey. 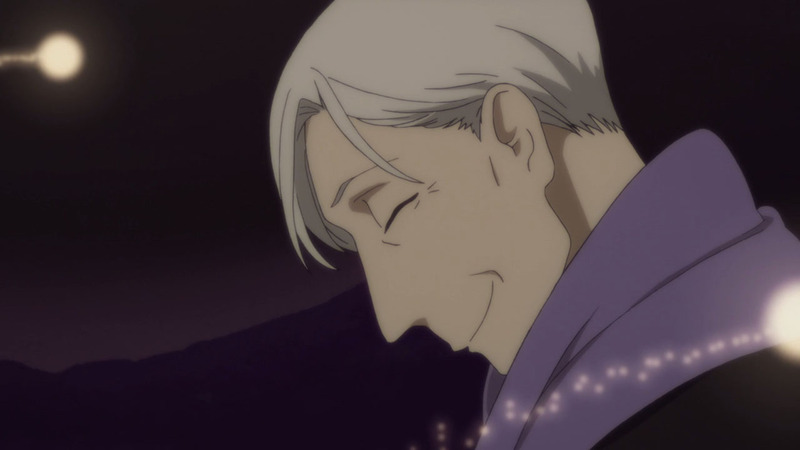 some clarification needed… Did Shin exclaim “dad” during Yakumo’s last performance? Anyone else catch this? Not sure if he was saying this to Yakumo (weird) or what he implied. Did I miss something? Glad to hear my picks for those categories brought you here! I didnt want to watch this on the day of its release. I wasnt ready yet. But after watching it today, my heart has never been so nostalgia watching everybody at one place all together again. 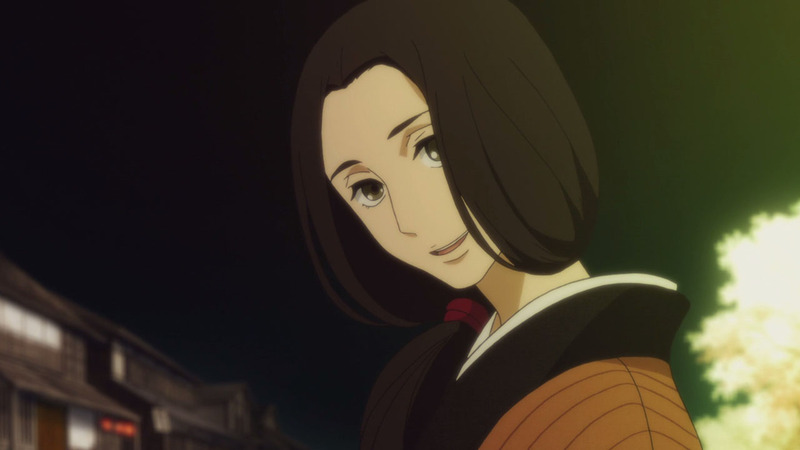 And Miyokichi, my Miyokichi,…after empathizing with her from season 1, i have never felt so happy for her despite the irony. She finally found her peace (no pun intended pls). 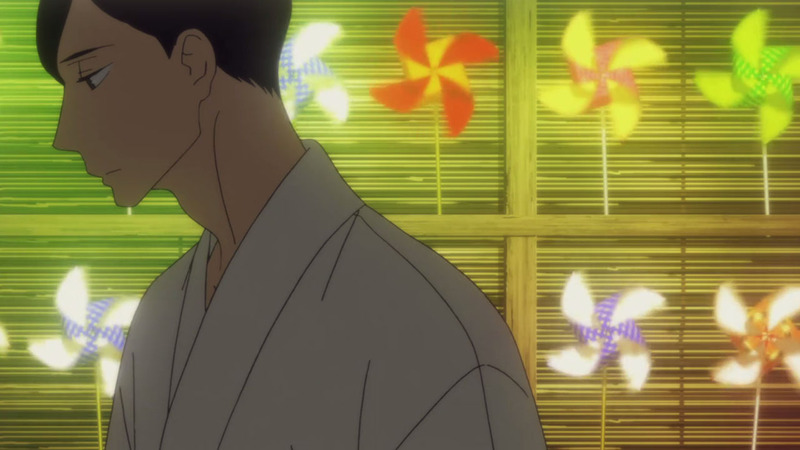 My heart went soggy seeing how “Konatsu” reuniting with Miyokichi in the afterlife. 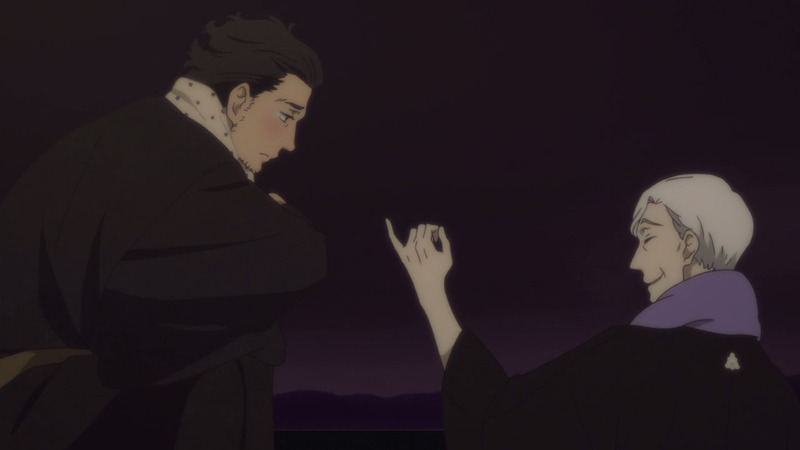 I dont want to talk out any sense of out this version of afterlife since this is Shouwa Genroku Rakugo’s version of it. But after seeing how everyone is enjoying each other’s company, how they matured and became wiser, i actually felt happy for them. I didnt really tear up in this episode. 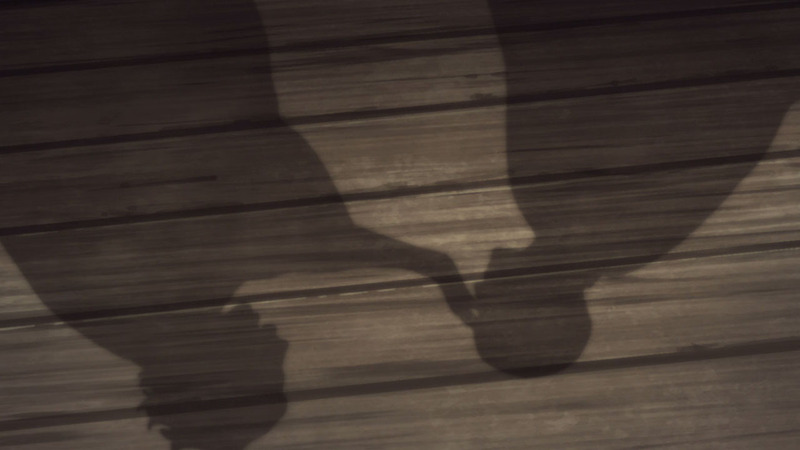 But when Matsuda suddenly appeared at the end of this episode, i was balling and sobbing to see everyone (except Konatsu) from first season has finally left us for good. 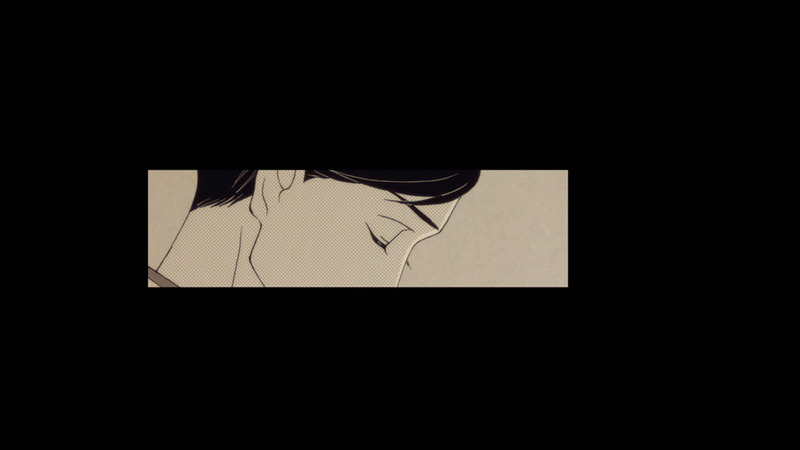 That was a perfect closure if I ever saw one. The three got to reunite and reconcile with each other. There was even an ultimate performance for the emblematic duo! 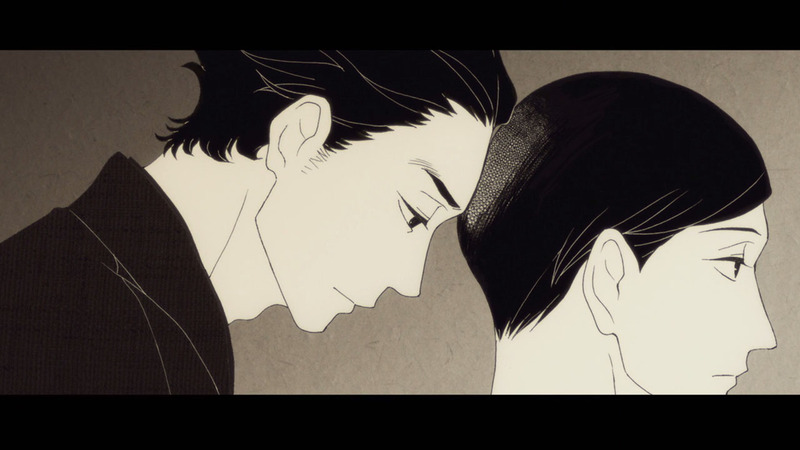 But what hit me most was that Sukeroku was too worried about his friend to pass on. He kept waiting until he could see him off. A friendship that persisted through death. Simply beautiful. Also the author actually went even beyond Shishou’s death to show us how rakugo fares in our current era and what the next generation is up to. This is going to be one hell of a finale. I’m happy to have followed this show during its run. Also, reading the impressions and everyone’s comments each week felt like hanging out with friends in a bar, I’ll keep fond memories of this. This episode is definitely one for the ages! We spent nearly two seasons following Yakumo’s life story. We’ve seen him at his best and at his worst, and finally, finally we and he gets his long needed closure with the ghosts of his past. What stuck with me the most is the inner peace of all the deceased. 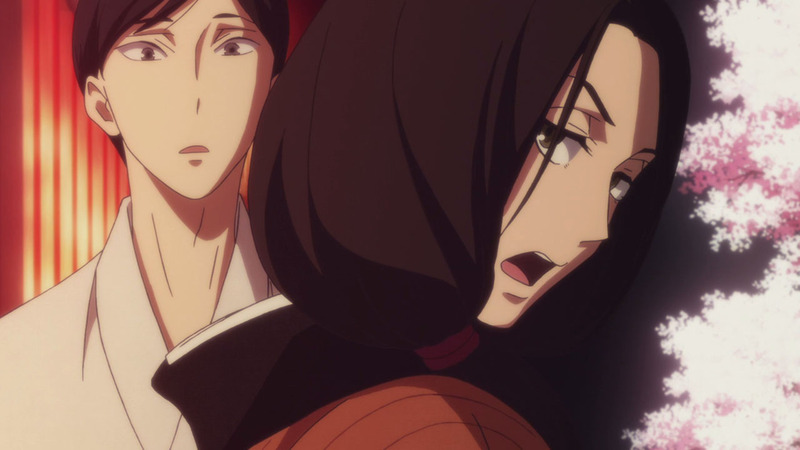 Yakumo, Sukeroku and Miyokichi, I was delightfully surprised by the mellowness and maturity they have gained posthumously they displayed throughout this episode. This brings me to mind of other characters who we see interacting with others even after they’ve died; Uchiha Itachi of Naruto, and Miki Sayaka of Madoka. In life, these people lived under huge burdens and huge mistakes in their lives. Ultimately their choices led them to broken relationships with their loved ones and their own demise. But death and their return of has mellowed them out immensely and freely acting in ways that are true to themselves, without (mostly) the concerns they carried in life. 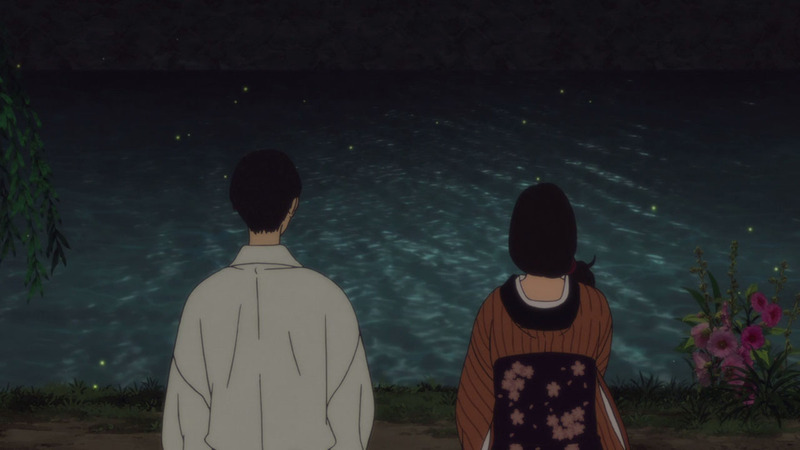 That’s what we got in this episode; Yakumo, Sukeroku and Miyokichi, living (for want of a better word) freely and true to themselves probably for the first time ever in their lives. It was beautiful. To paraphrase the Joker: “In death, people show you who they really are.” And so we have. A ninja, a magical girl, two rakugo performers, and an ex-courtesan. Death truly is the great equalizer.